LEDs use 75% less energy and offer a viable energy-efficiency opportunity but can have significant impacts on power quality as they are non-linear loads. LED lighting technology is significantly more complex than “traditional” incandescent light bulbs. It comprises many different components, each of which may have an impact on power quality. The semiconductor diode used to emit visible light consists of a substrate and primary optical unit. The device transfers heat generated in the LED away from the semiconductor diode into a heat dissipation system (the heat sink). There are usually a number of LED modules within single luminaires, as well as an electronic driver, connectors and optical the reflector, all within the housing. Fig. 1: Phase and neutral currents generated by single-phase rectifier loads. The electronic driver circuit converts the AC electric power supplied to it into DC supply which the LEDs can convert into visible light. Some drivers allow for light dimming. Harmonic emission (or harmonic generation) is a primary power quality concern. When AC power is converted to DC power via a semiconductor, high frequency current known as harmonics is generated. The harmonic spectrum and magnitude will vary based on the semiconductor technology used and the type of network connection (single or 3-phase). LED lamps are typically single-phase loads and are connected between phase and neutral. Single-phase DC rectifiers are notorious for generating a wide harmonic spectrum – from the second to the 50th order – with dominant zero sequence third harmonic order. Elevated harmonic distortion levels will usually stress the electrical distribution network when the total demand distortion (TDD) exceeds the IEEE 519 harmonic standard limits. When dealing with a single phase rectifier, specific attention must be given to the zero-sequence harmonics, particularly the third harmonic order, as it will have the highest magnitude in the harmonic spectrum. The singularity of zero sequence harmonics (3rd; 6th; 9th; 12th; 15th …) is that they add up perfectly in the neutral conductor, and the neutral current magnitude can reach 1,7 times the level of current flowing in the phase conductor. This presents a risk for neutral conductor overload. To resolve this issue, the most common solutions involve using a neutral conductor with a cross-section of the phase conductor. Fig. 2: Current waveform of a 15 W LED lamp. Figs. 1a, b and c show the phase current and the neutral current generated by single-phase rectifier loads and their generic harmonic profile. Fig. 2 shows the current waveform of a 15 W LED lamp: the waveform deviates greatly from a regular sine wave because it is rich in harmonic current. 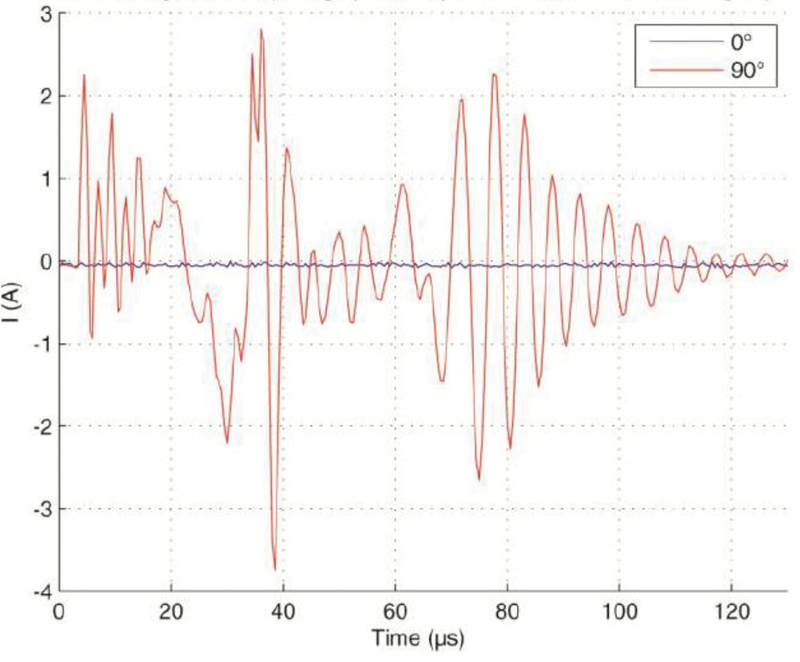 The current harmonic magnitude extracted from the waveform is shown in Fig. 3. Like any other appliance, LED lamps must comply with several directives. The IEC 61000-3-2 standard sets harmonic limits for equipment which draws 16 A or less. According to this standard, equipment is classified within four classes, in which lighting is class C. This includes light dimmers. Harmonic currents shall not exceed the power-related limits of the IEC standard’s Table 3, Column 2. 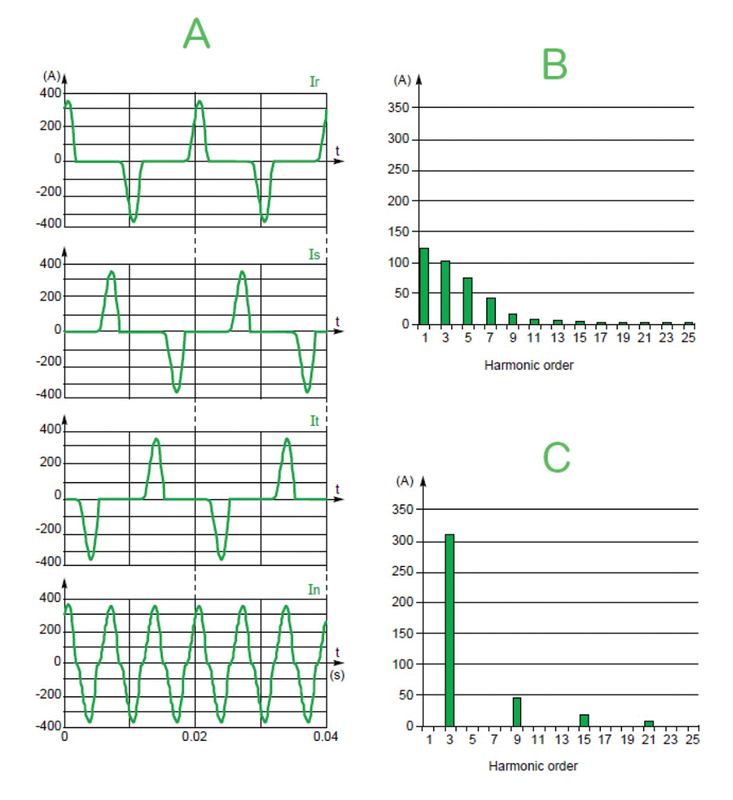 The third harmonic current, expressed as a percentage of the fundamental current, shall not exceed 86% and the fifth harmonic current shall not exceed 61%. LED lighting equipment will generate a relatively high level of harmonic distortion in current waveforms. For example, a 25 W LED lamp which complies with the IEC 61000-3-2 standard and injects 85% of third harmonic and 61% of fifth harmonic, obtains a THD(I) of 105%, which is extremely high. Fig. 3: Harmonic spectrum of a 15 W LED lamp. 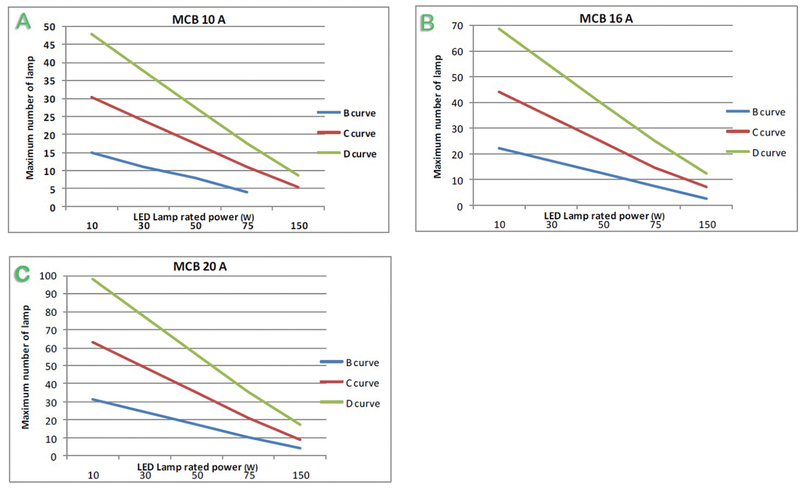 Fortunately, LED lamps have very low power consumption, only drawing a few mA. Also, newer LED driver designs incorporate power factor correction capacitors. 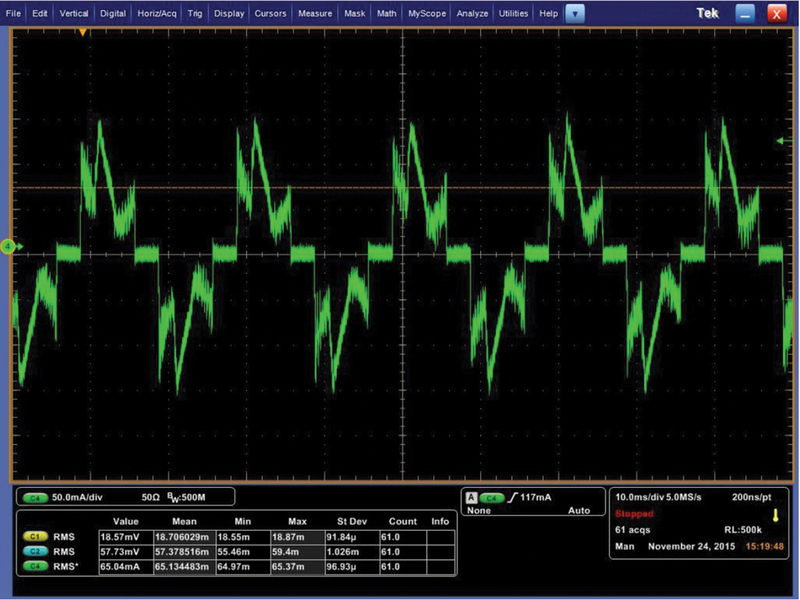 This not only improves power factor (PF), but also offers some harmonic filtering. This can reduce the THD(I) to 43%. If diversity of load is introduced in the circuit, some natural harmonic attenuation will occur via current vector cancellation, as well as when resistive loads are added to the same circuit resulting in further harmonic attenuation. 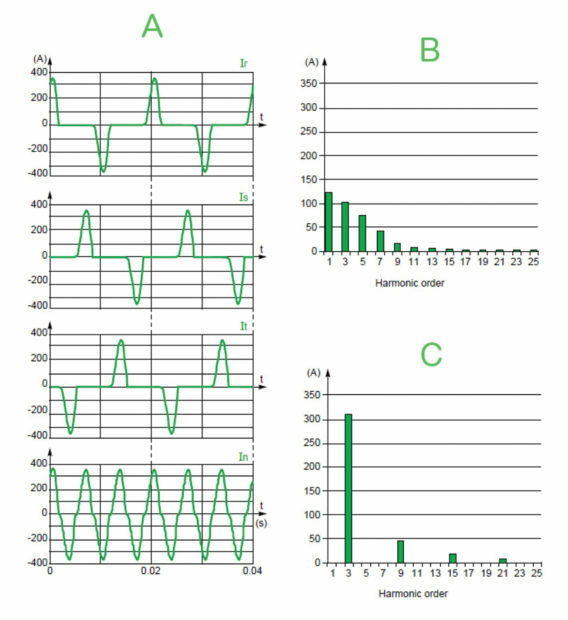 Normally, since the harmonic current flowing through the network impedance is low due to the low power consumption of LED lamps, it has very little impact on the total harmonic distortion on voltage, or THD(V) – usually below 5%. A harmonic issue could arise in an electrical circuit if a very high density of LED lighting is present with a low diversity factor. In this case, harmonic overload may occur on the bus, on the auxiliary transformer and in the neutral conductor. External harmonic mitigation such as an active harmonic filter device should be considered for this type of situation. Fig. 4: Tripping of a B-curve 20 A circuit-breaker. There are several types of LED driver on the market and the PF impact will vary based on the type of rectifier used if they are uncompensated, compensated with capacitors, or if they have built-in passive filters or active filtering devices. Socket-type bulbs with power below 10 W tend to be uncompensated and have a PF ranging from 45 to 80% lagging. LED panels, which consist of several strips of LEDs placed in parallel in the panel and fed from an external ballast, normally have a PF greater than 90% lagging when operating above 50% loading, and a PF ranging from 30 to 85% when operating below 50% loading. The dimmer, which is an integral part of the ballast, has a big impact on the PF. Experiments conducted on street lighting show that LED luminaires ranging from 30 to 200 W have a PF in the range of 92 to 98%. The Energy Star programme requirements for integral LED amps gives us one more reference. Where lamp power is 5 W or less, there is no PF requirement, while for lamps with a power greater than 5 W, the PF must be greater than 70% lagging. However, a wide range of results and references are possible. The assumption is that LED lamps of 10 W or less (and older LED technology) will have low PF, and that LED luminaires with more than 10 W (and newer technology) will have a PF greater than 90%. In the event of an installation with poor PF due to LED lighting, external capacitor-based compensation equipment can be used to correct the PF. In such a case, it is recommended to use de-tuned capacitor systems as they are designed to correct PF in harmonic rich networks. Fig. 5: Number of luminaires downstream of a circuit-breaker. In the initial moments after the luminaire has been energised, a significant transient current appears (up to 253 times the rated current according to studies by Schneider Electric). The duration of the transient current can be less than 1 ms for one luminaire. The transient is due to the capacitors used to perform the PF correction. The PF of such compensated luminaires is generally greater than 90%. In any electrical network the choice of circuit-breaker depends on the nature of the load powered. The rating depends on the cross section of the cables to be protected and the over-current protection curves are chosen according to the load’s inrush current. Since no normative tripping threshold curves exist for transients which last for less than 10 ms, Schneider Electric performed measurements at a commercial building’s lighting installation. This was deemed a typical installation, which will help with circuit-breaker selection. It is therefore necessary to select the correct circuit-breaker during the design phase. The peak value of the current at switch-on depends on the energising time, the number of luminaires forming the lighting circuit and the short-circuit power and architecture of the network (see Fig. 4). The curves presented in Fig. 5a, b and c provide information relating to the number of luminaires which can be connected downstream of a circuit breaker depending on its characteristics (the rating and tripping curve of the magnetic protective device). These curves were produced based on the unfavourable conditions which generate a maximum current peak at circuit energisation. Fig. 6: Earth leakage current test results. The commuting contactors are also impacted by the LED lamps’ high inrush current. Contactor deratings given by manufacturers must be considered in the design phase to obtain the best adapted coordination with LED luminaires and performance compliance (electrical endurance). For 3-phase circuits (power supply of luminaires between a phase conductor and the neutral conductor), switchgear and control gear of the 3-pole type is preferable to a control device of the 4-pole type. Not switched, the neutral conductor will help to prevent harmful voltage surge at power frequency from being applied across the terminals of the luminaire if the neutral conductor fails to close. Alternatively, a smart solid-state contactor, activated at the voltage zero crossing, can be used for LED energisation. 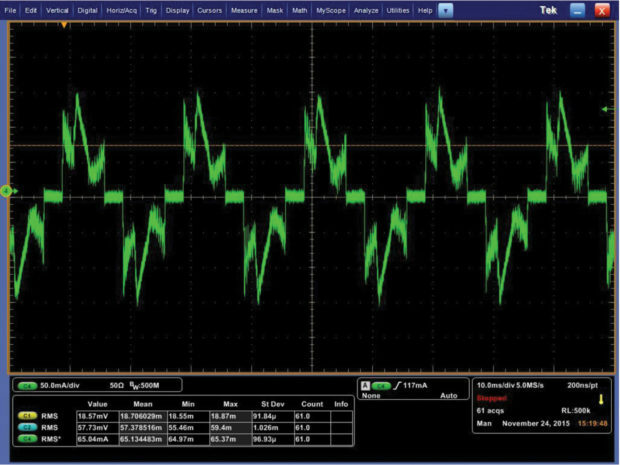 When the control voltage is applied to the relay input, an internal static component performs the switching function at zero crossing of the voltage waveform. The precision at switching (connection to the network) is excellent. The inrush current is then reduced and it is possible to use circuit breakers without derating. The number of luminaires which can be powered by a single circuit is limited only by the thermal withstand of the smart relay. 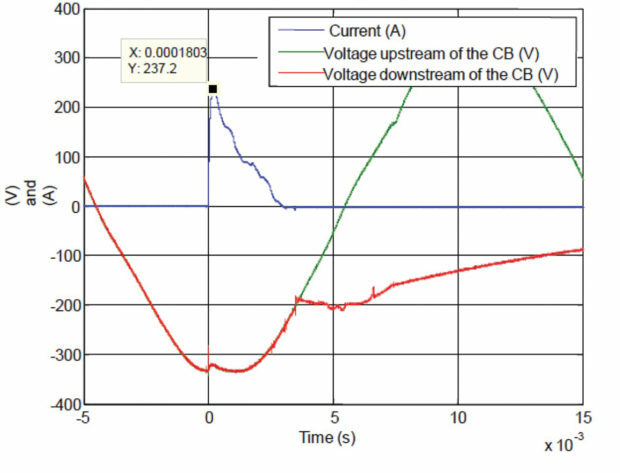 The measurements taken show that the leakage current is at maximum for switching on at the voltage peak. The frequency of this transient current is about 100 kHz, which is high. 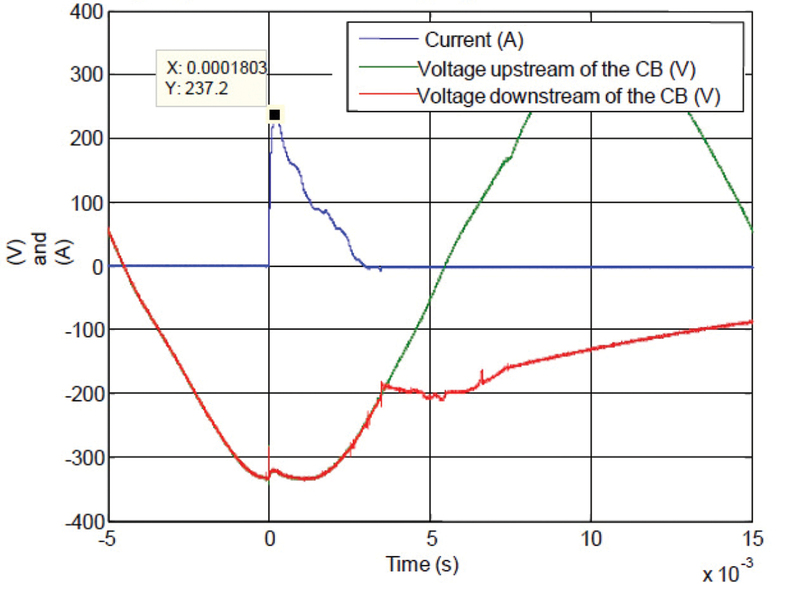 For switching on at zero voltage, the leakage current is practically zero (see Fig. 6). 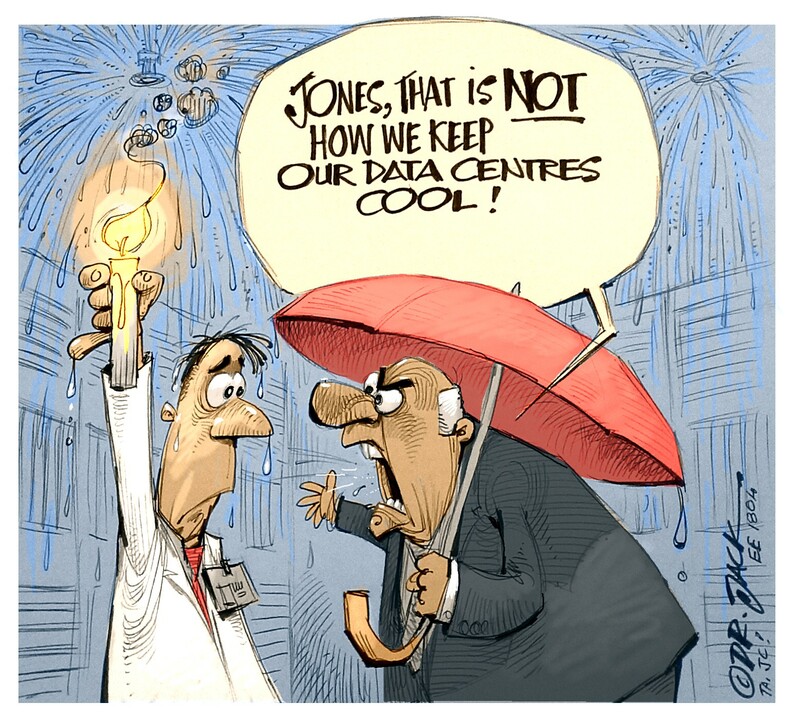 The permanent earth leakage current at 50 Hz is generally less than 1 mA for a luminaire. Given that lighting circuits are protected by earth leakage protection devices of 300 mA rating, many luminaires can be installed downstream of a protective device. At 100 kHz, the current is not detected by the earth leakage protection device. LED lamps are non-linear loads which generate harmonics in low voltage networks. Inrush current will have the biggest impact on the power factor of electrical networks, so manufacturer derating recommendations should be respected to avoid nuisance tripping of the circuit-breaker. Harmonics issues can be encountered when many LED luminaires are installed on a network but this can be addressed by installing external reactive compensation systems to correct the PF if it becomes an issue with the utility.